In this timely work, Stephanie Dowrick offers a profound and highly accessible study of one of literature’s most exciting and inspirational voices. 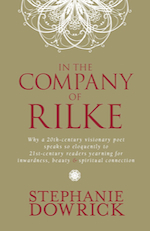 Her study of the visionary poet, Rainer Maria Rilke, includes more than 90 of Rilke’s most sublime poems, many translated here for the first time by poet and scholar Mark S. Burrows. She also offers a fascinating analysis of Rilke’s extraordinary life and work from an explicitly spiritual/literary point of view. The book also includes stimulating, provocative discussion of the experiences of readers.